Well. 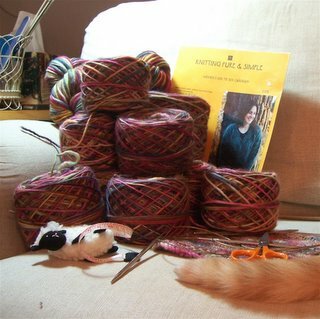 I’m ready, and anxious to get going on my Olympic Knitting. [Purlewe points out that OK sounds a whole lot better than KO, and she’s right.] [And Cara’s use of the word “knathletes” just makes me giggle.] I might even make it home from work a bit early tomorrow. J is taking the afternoon off. 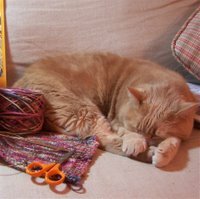 We thought about getting together to cast on, but that would cut into our knitting time! My coach is ready, too. She takes her job very seriously. May your needles fly like the wind and the yarn flow knotless through your fingers! I think I’m ready. I’ll even be able to cast on at exactly 2pm, even though I’ll be at work … the cast on is only 2 stitches – so I’ll CO at 2pm and then get busy when I get home from work.Send alcohol! yo babe.get your knit on! It is time to do your best performance evah! and I know you can handle the pressure!great to see you are all rady, give that coach a cuddle for me and I hope to see you on the other side with your medal!